Led by the inimitable songcrafting and vocals of Jubilee Connolly (yes, that's his real name), the collective known as Jubilee Gardens hits pay dirt on their latest (and fourth) album Star Struck. Featuring a large collection of interesting players that feature guitarist Dan Hunt, keyboardist Paul Provost, drummer Joe Zupan, percussionist Luis Fraire, oud player Ed Melikian, bassist Gail Hunt, cellist Mary Melanic and violinist Rainer Reichel along with guest Bill Fanning on horns, the gathering takes on a synchronous jam band stance while keeping the songs tight, calculated and well oiled. The opening track (and our favorite) "If You Told Me" offers fans of Jerry Garcia and The Grateful Dead a well played number that skirts the side of improv while remaining true to it's arrangement. This radio friendly track will appeal to a broad base of rock aficionados that dig the jam effect as much as great singing and playing. Next up, "Smiles" finds Connolly's vocals sounding reminiscent of Leon Russell's while the band turns in infectious rhythms that keep toes tapping and heads bobbing. This cut too should find it's way to playlists everywhere. Others songs of note include the dark swoon of "Naked", the mesmerizing groove of "Ways of Seeing", the amusing reality of "Lost In The Woods", and the introspective "My Friend". 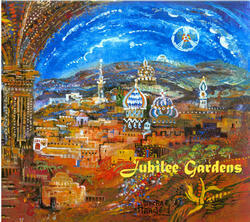 Jubilee Gardens is a well conceived band of fine players that deserve to be heard beyond the local level. Good stuff! Jubilee Gardens new release titled Star Struck is one of those rare albums that come in like a breath of fresh air lyrically and musically. Jubilee and the band have proved over the years to be consistent in their musical growth and this one doesn’t disappoint. 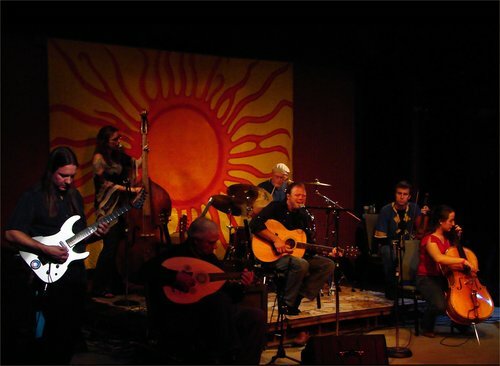 The band is made up of Jubilee Connolly – vocals and guitars, Dan Hunt – guitar, Paul Provost – keyboards, Joe Zupan – drums and percussion, Luis Fraire – percussion and drums, Ed Melikian – Oud, Gail Hunt – bass and background vocals, Mary Milanic – cello, and Rainer Reichel – violin. The album kicks off with the bouncy “If You Told Me”; this tune is a showcase where you can hear how well the band gels from Dan’s lead guitar, to the Oud, to the percussion and keys everything just fits nicely. The second song “Smiles (When You Come Around)” is another showcase moment on the album, a breezy dance tune with a great lyrical hook. This one also showcases Jubilee’s vocals, when listening to the band you can’t help but love his lyrics and voice, he is definitely unique and part of what makes the band’s sound which is hard to classify, genre wise. “Ebb & Flow” brings back memories of the 60’s San Francisco band It’s a Beautiful Day with the haunting cello and violin complimenting Jubilee’s lyrics asking “Are we going to give into fear, when all we want is love and loves here”. As I mentioned earlier the album is layered with sounds to the extent that as you listen you can pick out each instrument, nothing is buried. The percussion on this track is a key part that helps in bringing the message and power of the song together. “Naked” starts off with a beautiful acoustic refrain and has a great chorus “And she smiles and I feel naked, naked as the day I was born”, this one along the next track “Proverb” are powerful in their messages with the chorus in Proverb stating “Things don’t seems so bad, things don’t seem so sad” backed with a cheerful melody and you can’t help but perk up when you listen to it. The song “Test The Water” really show off the versatility of the band and their ability to fuse the Middle Eastern influences with American Indie Folk and make it their own. Ed Melikian is a master of the Middle Eastern Oud, an eleven string fret less ancestor of the guitar and the way that the band plays the Oud off of the acoustic guitars will just amaze your ears. The track “Ways Of Seeing” starts off with a building guitar riff followed by piano and drums, this one is a joy to hear live and slips back and forth from a pop song to a dance able jam tune with some tasty licks from the aforementioned Dan Hunt a great guitarist with a truly unique sound. "The Other Shoe” starts off with a nice lilting piano intro and when the vocals begin you are immediately drawn in to the story. Jubilee is singing about a time when love begins to fade in a relationship and most people can relate to his lament. As I have mentioned the lyrics in all of the songs Jubilee writes are from the heart and personal experiences, he has a way of telling moving stories without getting lost in words. “Two or Three” is a restrained track featuring horns intertwined with the beautiful piano playing of Paul Provost who it should be noted handled the excellent job of mixing of the album. The track “Lost in the Woods” sounds like something that could have been included on Bruce Springsteen’s The Seeger Sessions. A rollicking story of a woman lost in the woods with no clothes on, starting with an excerpt of a news report of a woman who had just experienced it firsthand. “Its About Time” is another contagious dance song with Jubilee proclaiming to be “stuck on you like the craziest of glues”. This is one of those songs where everyone in the band seems to be rolling with the flow. The song has a great building tempo with everyone adding their own personal touches in at various points. This is also one of their stronger live songs and if you have a chance to see the band you will not be disappointed. The title track “Star Struck” is another one that brings the listener along on a lyrical journey; noticeable in this one is how well Jubilee and Gail’s background vocals mesh perfectly adding and filling out the sound rather than competing against it. The melancholy “My Friend” about saying goodbye follows making the listener feel the pain and loss echoed in the lyrics “My friend don’t cry for me. I’ve cried enough for two”. “Whole Wide World” starts with the lyrical advice “You can’t own the whole wide world, you can own the world you live in and that’s all you’ll ever notice anyway” advising you to not worry about what you can’t control, great advice these days. The album closes with “When The Angel Came” a soft acoustic number again featuring the beautiful harmonies between Jubilee and Gail Hunt. The album is a treat for fans and new listeners as well, this recording has been on my list of highly anticipated releases for a while and it was worth the wait. "Dan Hunt's searing guitar licks, Mary Servatius' dramatic cello, and guest appearances by baritone sax player Neal McNanna and doumbeck player Leon Manoogian were a few of the items worthy of a spotlight during the mixing process- and that was just during two songs." "newer songs have more of a political bent..One jaunty, cartoony folk song of the sort The Beatles used to break up it's more serious sounding songs lets Connolly poke fun at president Bush without sounding acerbic. Another popular song from the repertoire making it onto the new record is 'Gold and Metal Man,' a jazzy groove heated up by Connolly's criticism of consumer culture." "These songs are so good that the mixing process is just a matter of editing. I'm just trying to pick out which parts of the songs to spotlight at different times. " - Roger Lavallee/ mixing engineer at Tremolo Lounge.
" 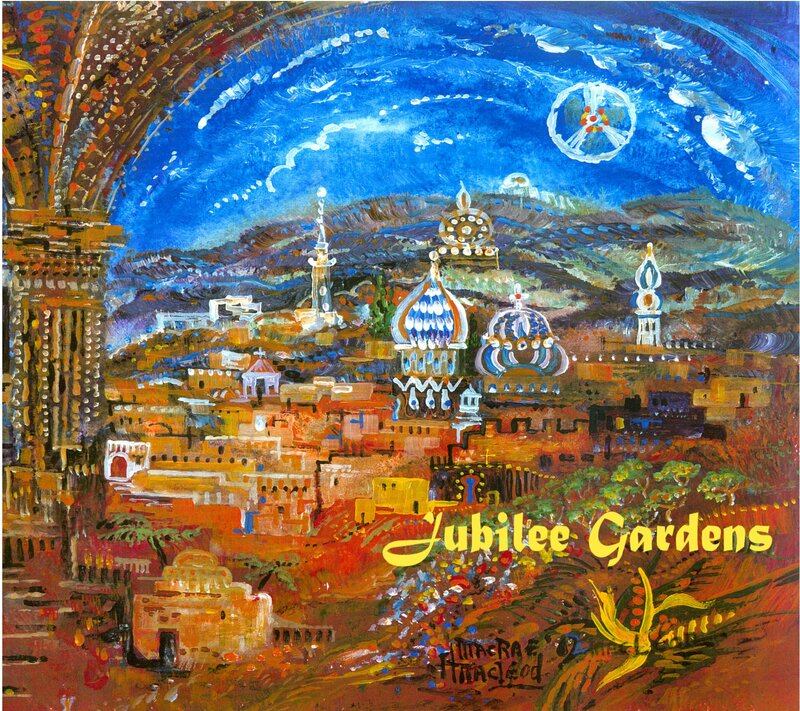 Jubilee Gardens delivered a richly textured album of their multi-culti jazzy folk pop." check out myspace.com/jubileegardens This site was recently made much cooler by Gail's sister Alanna-- a big thanks to her!!! Mary Servatius - cello- away getting her PHD, but back in town for visits & gigs once in a while! under the umbrella of sophisticated arrangements that fuse jazz, pop and folk elements."